In the past, consumers interested in hiring a cleaning business would just consult family members, friends, neighbors, and even the yellow pages. SEO was just a collection of letters, nothing more. Now? The internet has bumped these previously trusted sources lower down the list. 97% of consumers read online reviews for local businesses before they choose a service provider— 12% search for local businesses online daily. The last place a consumer would search would be the yellow pages (if they even have a phone book in the house). They head straight to the internet. If you’ve got an online presence, you might think that you’re covered; however, if you’re not listed on the first page of the search engine results, you could be missing out on more business than you know. More than 67% of clicks on search engine results pages (SERPs) go to the first five listings. The first page gets 95% of web traffic, with subsequent pages seeing a paltry 5%. How do you ensure that your business is featured prominently when a prospective customer starts to search for local cleaning services? Search engine optimization, or SEO. Search engine optimization, or SEO, is simply a method of driving more (and more qualified) traffic to your website via organic search engine results. 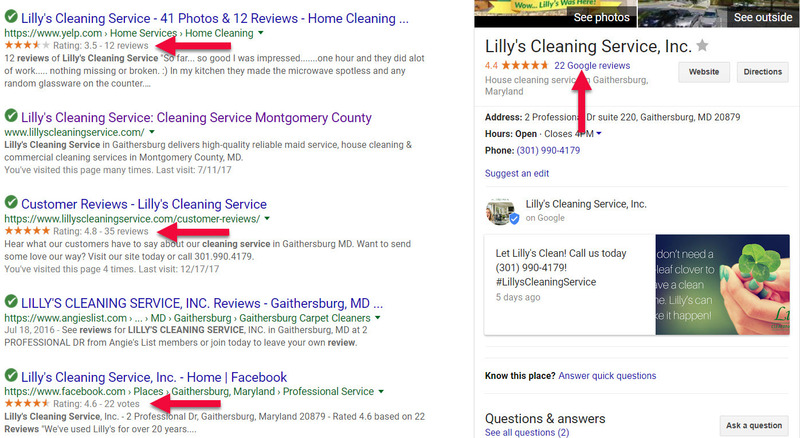 In other words, utilizing SEO practices will help your cleaning business place higher on a search engine result page so more people will be likely to see it. There are two types of SEO: On-site SEO and off-site SEO. On-site SEO means that you’ve optimized the elements on your website to improve your search engine visibility and ranking. You ensure that the content and the HTML source code on every page of your website is specifically directed toward driving as much qualified traffic toward your site as possible. Off-site SEO is the action you take beyond your business’s website to improve your SERP rankings. This form of SEO relies heavily on improving the perception of your site’s popularity, for search engines as well as for users. You want both potential customers and search engines to see you as a relevant, trustworthy authority. Let’s get into the specifics of each type of SEO and how it can impact your cleaning business. When you engage in on-site SEO, you’re working exclusively on optimizing your business’s website for increased visibility. 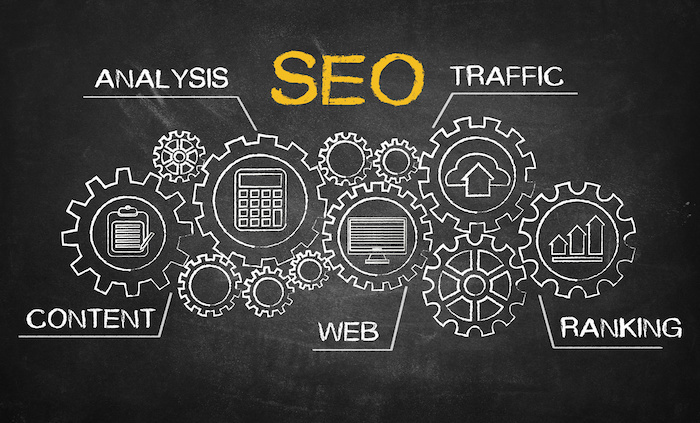 Here are just a few of the tactics that will successfully improve your SEO ranking. Keyword-focused titles— Determining the best keywords for your content and pages is easy, especially when you employ the right tool. One simple way to boost your signal is to ensure that your titles are centered around one of the keywords that are best suited to your business. Descriptions— Making sure that every blog post and webpage has a concise, keyword-rich description (between 50-300 characters is recommended) will help attract more attention to your site. Good news— you don’t have to be a tech genius to update your description. If you’re using WordPress, the Yoast SEO plug-in makes it simple to edit each page’s description. Not using WordPress? Play with the platform; you’re sure to find a way to enter a description. Tags— In this case, we’re specifically referring heading tags and alt tags. The heading tag should contain the most important keywords for the page— if you can, put the keyword at the beginning of the heading. It will help the reader (or the search engine) know instantly what your page is about. The alt tag is contained within the image tag, and it allows search engine crawlers to interpret images. If you don’t use an alt tag, your page could be ranked lower, simply because the robots are unable to determine all the contents of your page. Bottom line, you don’t want the dreaded “description unavailable” message to appear on the SERP, simply because you didn’t address very simple optimization tactics. Structured Data— Basically, structured data refers to the implementation of a systematic markup of your website’s pages to provide more detail about the content within. Organizing the markup will increase the search engines’ understanding of your site’s content, helping with relevancy signals as well as enhancing SERP ranking, which will improve your click-through rate and increase web traffic. Structured data for SEO typically involves a particular vocabulary, specifically Schema.org or Microformats.org. Locally-Focused Content— Incorporating localized content on your website will bring consumers seeking a local business straight to you. 46% of all Google searches are local, and if you have content relevant to your location throughout your website, you’re more likely to draw your audience to you. Optimized Blog Posts— Above all, your blog posts should offer valuable information to your audience— in your case, you’ll probably offer useful tips about cleaning. Education is key to customers seeking more knowledge about your industry. That said, you’ll get more eyes on your posts if you ensure that you’ve incorporated well-placed keywords into your posts. Search engines (and readers) frown on the practice of keyword stuffing, so be sure that you implement keywords judiciously. Ok, it’s time to take your SEO beyond your website. Off-site SEO refers to the actions that you take outside of your website to improve your SERP ranking. There are a variety of ways you can boost your results. Google My Business Page— Claiming and verifying your free Google My Business (GMB) listing is a vital first step in implementing your off-site SEO strategy. 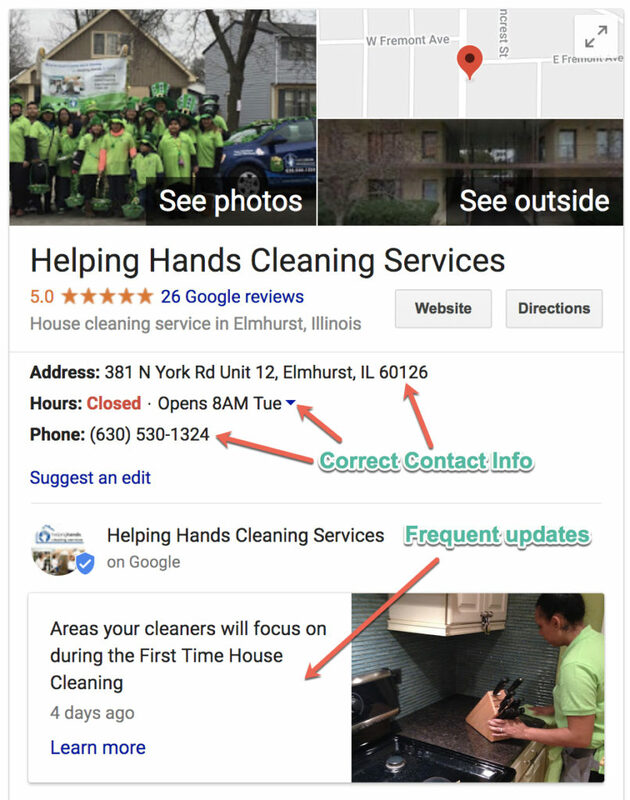 In addition to improving your chances of climbing higher in the SERP results, you’ll also be able to give prospective clients important information about your business (such as your phone number and payment types accepted) and you’ll gain an instant air of legitimacy when you’re listed as a business on Google. Citation Directory Management— In addition to Google My Business, there are other business directories available. Ensuring that your information is up to date on these is an important part of your off-site SEO strategy. If you don’t keep a close eye on these business directories, they could be sharing erroneous information with local internet users, which could have a negative impact on your cleaning business. Our free scan let’s you know what needs to be fixed! We provide our clients with a Power Listing service that allows to easily update, optimize, and control your online listings across the entire web. Online Reviews— If you’re not paying attention to your online reviews, you might be missing out on a big opportunity for organic off-site SEO. A whopping 97% of consumers consult online reviews for local businesses, and 85% of consumers put as much trust in online reviews as they do in personal recommendations from friends and family. Positive engagement with your customers is a big plus for many consumers— 30% say that local businesses who respond to reviews are appealing to them. How do you ensure that your business is being honestly reviewed? Solicit reviews from satisfied customers! 68% of consumers left a review after a local business asked them to— it can’t hurt to ask! Your Facebook page is another good place for customers to leave feedback and for prospective clients to see what current customers have to say about your services. Links to Your Site— Yes, internal links on your site are good. But links to your site from other sites are great. It gives you instant credibility when an important local website references your business and includes a link back to your website. Not only will the Google crawlers give your SERP ranking a bump, but you’ll get an influx of traffic from folks who click the link on the other website. Seek to build relationships with local media and review sites, and don’t forget to include a link to your site in your customer emails and newsletters. The more eyes you get on your site, the better! Implementing a good SEO strategy will ensure that more qualified, ready-to-commit customers see your business first. However, creating a good SEO strategy can be an intimidating prospect. Marketing Systems by Design offers expert SEO services, ranging from a full SEO audit to link research. Contact us today for advice about optimizing your SEO. Interested in learning more? Start with our free SEO report card!